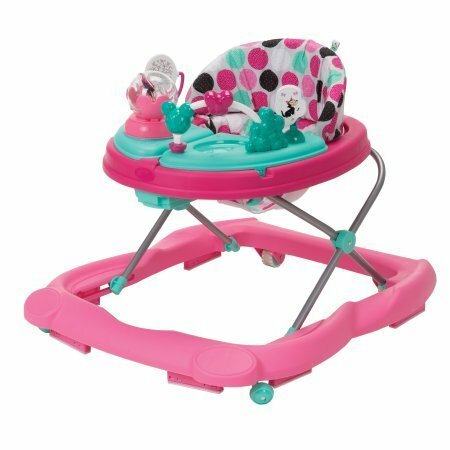 The Disney Baby Minnie Mouse Music and Lights Walker offers plenty of fun for your little one. The over-sized play tray features four Minnie Mouse and friends toys and conveniently swings open to reveal a snack tray perfect for little treats or other toys. Sturdy wheels work well on floors and carpet alike, while the grip strips reduce walker movement on uneven surfaces. With a machine-washable padded seat, cleaning the walker is as easy as A-B-C.